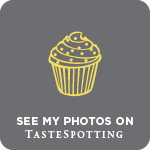 Not my paternal grandmother – a skilled home baker whose larder was always stocked with a homemade chocolate cake, fluffy scones or knobbly rock buns the size of a fist – but my mother’s Mum. The same amazing woman who would serve stale Maltesers had little interest in baking, producing meringues from a packet and filling them with cream from a can, yet somehow this dessert remains utterly magical in my memory. While the uniform, chalky sweetness of shop bought meringue nests will always hold a special place in my past, nowadays I prefer to make my own. Meringue is so simple to whip up using store cupboard ingredients and also provides the perfect excuse to make an egg yolk rich ice cream at the same time. Making your own meringue also allows you to play around with the ingredients, using brown or white sugar to caramelize and crisp or adding in nuts or cocoa for flavour and texture. 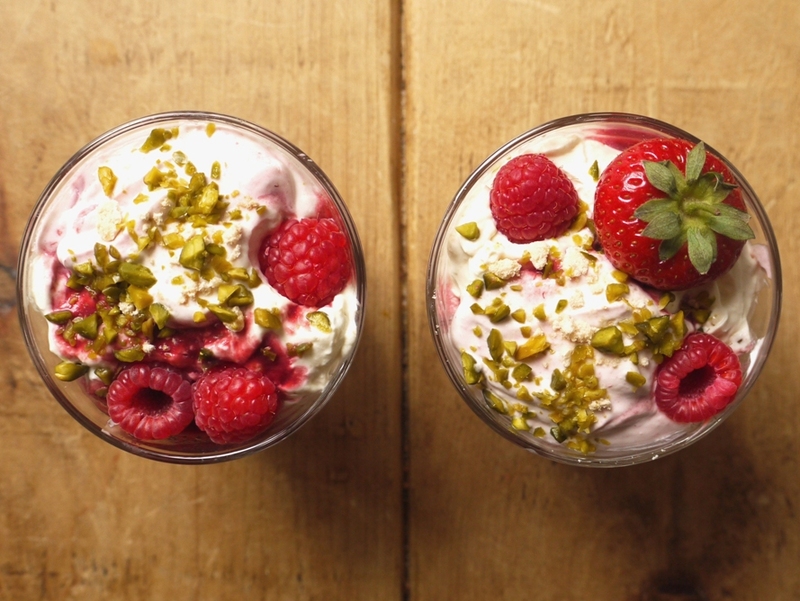 A little egg white goes a long way and one of my favourite ways to use up leftover meringue is in a simple Eton Mess. But while sweet cream, crushed meringue and the juiciest of summer strawberries are a pretty much perfect combination, I’m not sure you need the basic recipe written down here. Instead I’m sharing a slight variation on the classic, involving a little sharp yoghurt, the crunch of nuts, a summery fruit syrup and those all-important homemade meringues. I’ve included Greek yoghurt primarily for taste rather than health reasons: I like the slight tang against the richness of cream and find full fat works best, but if you’re trying to lighten the load you could substitute a low fat version if you wish. Summer fruit is also fairly interchangeable: try cherries with flaked almond meringue for something a little more sophisticated or make it into an altogether smoother affair with a soft compote of rhubarb or gooseberry. Whenever we asked my Granny what was for pudding, she’d always tell us ‘Wait and see’. We knew exactly what was coming but somehow a sense of mystery made the whole experience more exciting. One day I plan to keep the tradition alive by doing exactly the same thing for my grandchildren, even if I am an awful food snob and refuse to use shop-bought meringues. Preheat the oven to 150 degrees C. Line two baking trays with parchment paper. In a large, clean bowl, whisk the egg whites until soft peaks form. Whisk in the sugar, a little at a time, until fully incorporated and the meringue is thick and glossy. Dollop rounded dessertspoonfuls of meringue onto the prepared trays, leaving a little space between each meringue. Scatter with the chopped pistachios. Place the meringues in the oven, turn the temperature down to 140 degrees C and bake for one hour. Without opening the door, turn the oven off and leave the meringues to cool completely inside. 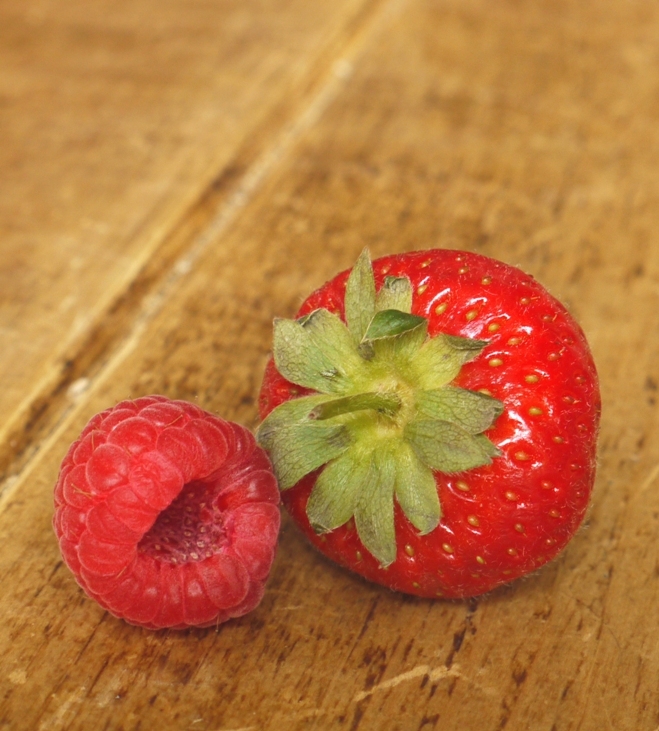 Combine the raspberries, lemon juice, honey and water in a small pan and bring to a simmer. Reduce the heat and cook for about five minutes until thick and sticky. Remove from the heat and pass the mixture through a fine mesh sieve, discarding the seeds. Set aside to cool. Whip the cream until soft peaks form. Fold in the Greek yoghurt then divide between two bowls. Crumble about three quarters of the meringue into one bowl along with the raspberries, reserving a few for decoration. Swirl the other bowl with half the cooled raspberry syrup. Drizzle a little syrup into the bottom of six small glasses or bowls (I like glasses because you can see the layers). 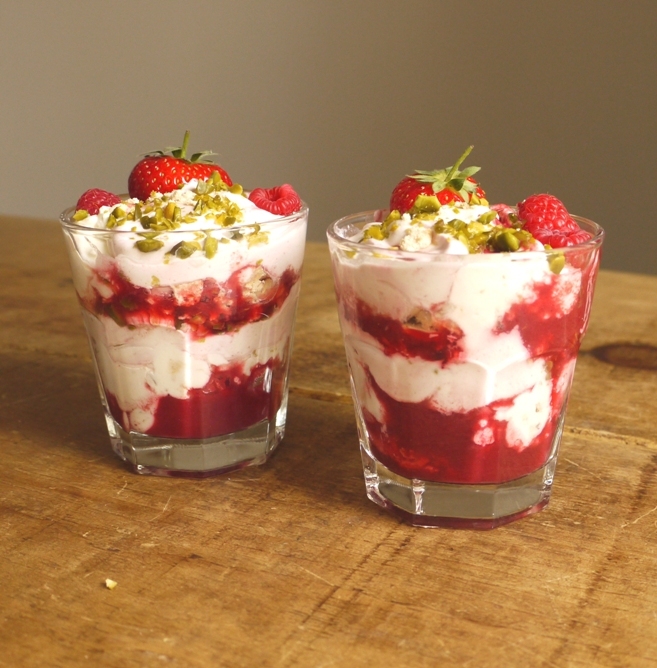 Top with a spoonful of meringue mixture followed by a spoonful of raspberry cream, a little crumbled meringue, a few slices of strawberry, some chopped pistachios and a little more syrup. Repeat the layers until all the mixture is used up, finishing each glass with a fresh raspberry and scattering of nuts. Serve as soon as possible as the meringue will start to lose its crispness, although I’ve been know to happily polish off any leftovers the next day. How do the homemade meringues hold up here? I know there’s a Delia recipe for a lemon meringue ice cream where she advises using shop bought meringues as they stay a little more crunchy even when combined with the cream etc. Either way, this sounds wonderful. I love the idea of greek yoghurt to cut through some of the sweetness and the crunch ofthe nuts. Lovely! Oh, so yummy and summery! My girlfriend, who spent 20 years in England, introduced me to the Eton Mess, but with chocolate. This is a must try for me! Looks so creamy and delicious! I love your photographs! This is one beautiful mess! In the absence of a mess-making grandma, I will be making my own. I love messes! And this one is picture perfect!!! I love the name, the colors, the whole thing. What a wonderful idea to pair the pistachios with the berries! So lovely. I love how Greek yogurt is often one of those unintentionally healthy substitutes! I hadn’t discovered the eton mess until I moved to the UK, but it’s a brilliant dessert with all those contrasting textures. Creamy, crispy, airy, smooth…I’m just talking myself into a deep abyss of hunger now. 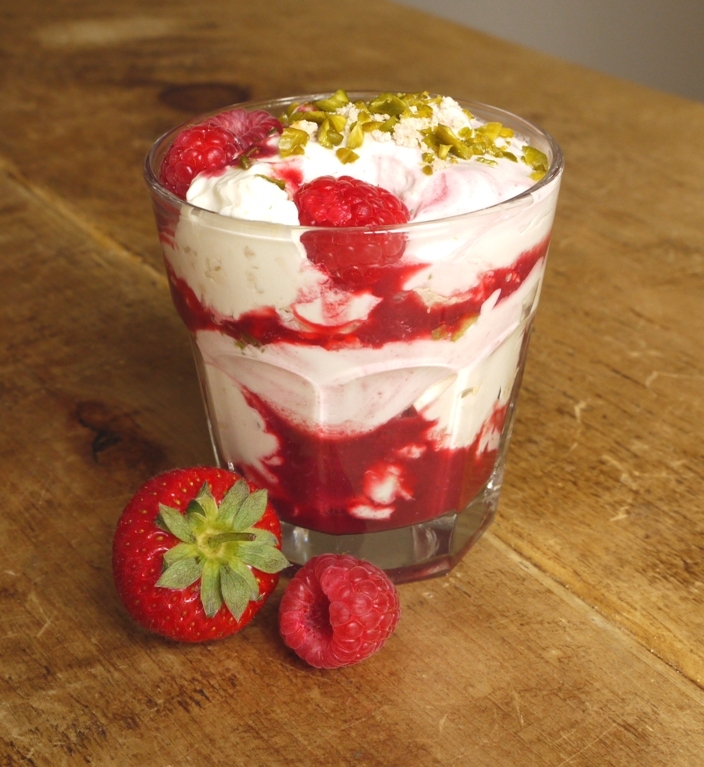 I adore Eton Mess, and with pistachios! So lovely. Oh this looks so good! After making the rhubarb fools I made last week, I was really itching to try an eton mess— I love the idea of having meringues in there. Good call with the greek yogurt too, that sounds really good in this. Your rhubarb fools looked fab – will definitely be making them soon. Oh…whenever I think of Eton Mess I think of London and my summers there! Love it and can;t wait to see you soon. This is a sophisticated eton mess Kate! I like the idea of something tangy to cut through so much sweetness. Raspberries and pistachios, some of my favorite things. My two grannies were opposites in the kitchen too. What a gorgeous looking summery dessert! I love it. Meringue makes me think of my granny too! I love the look of this dessert – so pretty! Ooh er – these look so beautiful as your photographs always do, but it’s particularly nice to see these glorious summer colours on a wet and cold June day and remind me of the gorgeous June days we were experiencing last week. I nearly made a rhubarb mess but went for the mini pavlova option in the end. I often combine yogurt with cream for the same reasons you’ve outlined, but using 50/50. Thank you! Wasn’t the weather gorgeous? I want it back! This looks delicious! I love the fact that you used Greek yoghurt – for the very same reason. Omygoodness. Raspberries and pistachios! What an amazingly good combination. I am making this. Today. This evening. I will not survive if I don’t. Tweet me a picture, I’d love to see your version! Last night turned into cinema visit. Will do tonight instead and tweet asap. These are gorgeous. I’m all over berries right now, and I love them in combination with pistachio. I like adding in tangy Greek yogurt whenever possible. It must taste wonderful and fresh here! I can’t get enough of nuts and berries at the moment either – breakfast, snacks, dessert, I love them! Seems we both had a similar train of thought! 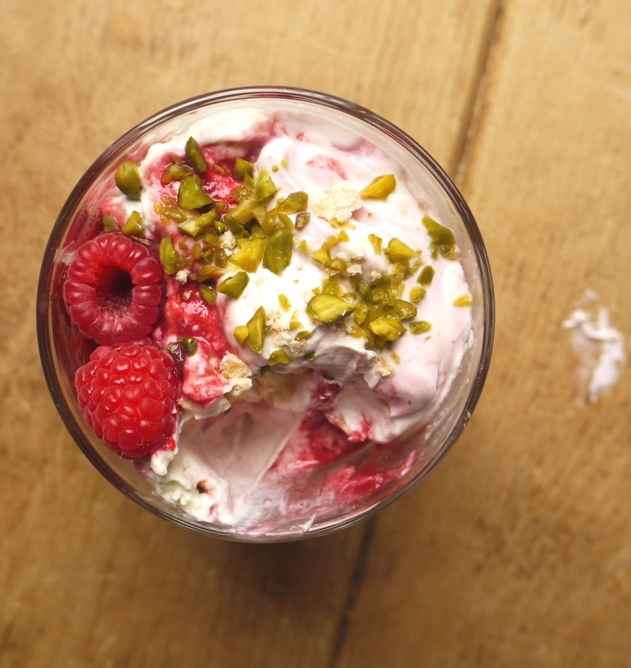 I just made a semifreddo with raspberries and pistachios. Eton mess is such a classic and always feels like such elegant comfort food. Your semifreddo looked beautiful, will definitely have to make that. You’ve never had Eton Mess? You have to remedy that, it’s so delicious (and so simple to make)! So pleased you liked the Bircher Muesli bread, it’s one of my faves. Sounds like such a delicious combination. I have heard the term Eton Mess before but never actually knew what it was until now, your post was super informative and made me very excited to try my hand at making my own. I loooove meringue and this will be a wonderful way to enjoy it! Thanks Eva. You definitely have to try Eton Mess, it’s so yummy – in it’s simplest form just cream, strawberries and crushed meringue.